Why it’s daunting: “Daunting” might be too strong a word to describe an obscure subgenre of British rock that was built on humble, nondescript, back-to-basics fun. As the name implies, the pub-rock movement of the early to mid-’70s was made up of what can only be called bar bands: gangs of ordinary, dressed-down dudes who looked like they worked at the local foundry or factory (and probably did), yet happened to moonlight as rock ’n’ roll revivalists. Unabashedly reactionary, pub-rock was a spontaneous knee-jerk against the rising tides of glam and prog, extravagant forms of rock that some people felt no longer spoke to the common, working-class bloke. 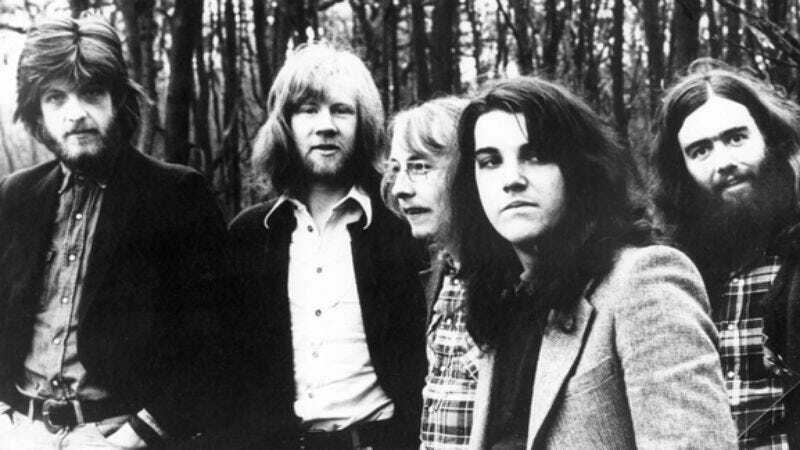 In America, that same populist groundswell helped propel the likes of Bob Seger and Bachman-Turner Overdrive to the top of the charts; in Britain, it resulted in a loose network of retro-minded, dumpy-looking groups that sought to perpetuate the rootsy authenticity of the likes of Van Morrison, Gram Parsons, and the upstart Bruce Springsteen. Granted, pub-rock’s anti-glitz, nose-to-the-grindstone ethic sounds strikingly similar to the punk manifesto that immediately followed, and in many ways, pub-rock helped pave the way for punk. (In fact, many of punk and new wave’s biggest stars, from Joe Strummer to Elvis Costello, paid their dues on the pub-rock circuit before chopping their hair, dressing up funny, and wholly reinventing themselves as rock ’n’ roll antiheroes.) Unlike punk, though, pub-rock never broke through to a mass audience—and as it narrowly missed the wave of independent record labels that sprang up in the wake of punk, a huge chunk of pub-rock went undocumented. But before the movement sputtered out in the late ’70s, a few indie imprints—most notably Chiswick and Stiff—did their best to immortalize pub-rock’s melting pot of power-pop, country-rock, R&B, rockabilly, and folk. In doing so, these labels unwittingly nurtured everything from nascent skinhead bands to some of pop’s greatest songsmiths. Why: Elgin Avenue Breakdown, the sole full-length by London’s The 101ers, is not the best, most distinctive, or most influential pub-rock album ever made. But it serves as the ideal entrée into the subgenre for one simple reason: The band’s berserk, shaggy, instantly recognizable frontman, Woody Mellor, was mere months away from morphing himself into The Clash’s lightning-rod frontman, Joe Strummer. Recorded in 1975 and 1976 but unreleased until 1981, Breakdown captures the future Strummer’s trademark bark and includes a ragged live version of the blues standard “Junco Partner,” a song that would pop up in slicker form on The Clash’s Sandinista! The album’s title evokes Springsteen’s “Tenth Avenue Freeze-Out,” but The Boss only dreamed of making music this primal: Frenzied and feral, the disc crams moldy rock riffs, R&B licks, and pure adrenaline through a sausage grinder. And that’s a good thing. As a bridge from pub-rock to punk, Breakdown is perfect, but it also showcases a hungry, budding young legend finding his feet and voice—and crafting a handful of slash-and-burn anthems like the sweet-talking, hell-raising “Keys To Your Heart.” The album is uneven and at times embarrassingly hilarious, but you can eat the joy with a fork. Next steps: Ian Dury never made the same impact as Strummer, but as the frontman of Ian Dury And The Blockheads, he was destined to become a legend in his own right. (He’d already taken a stab at stardom in the early ’70s as the leader of Kilburn And The High Roads.) One of pub-rock’s bona fide originals, The High Roads toured with The Who and released an ambitious (by pub-rock standards) full-length before grinding to a halt in 1975. The album, titled Handsome—perhaps a jab at Dury’s undeniable homeliness—is a sharp, witty sliver of backsliding rock ’n’ roll that seems to erupt from everywhere at once. A true kitchen-sink affair, Handsome sports everything from flute to steel drums to Sha Na Na-worthy saxophone onslaughts, all delivered with loping swagger and acidic, self-deprecating sarcasm. And unlike many of his pub-rock peers, Dury doesn’t try to tweak his accent and sing like Richard Manuel or Randy Newman; instead, he sounds quintessentially English, even while wallowing in a Tom Waits-esque ballad, a Bo Diddley pastiche, or some bizarre mishmash that transcends all borders, including those of sanity. The pub-rock band that enjoyed the most longevity and acclaim is Brinsley Schwarz. Though named after its guitarist, the outfit really revolved around the songwriting and lead vocals of bassist Nick Lowe. Brinsley Schwarz’s third album, 1971’s Silver Pistol, was its commercial and artistic breakthrough; while only a modest hit, its earthy yet sophisticated mix of The Band and The Byrds helped set the stage for the blossoming pub-rock scene. More notable: the group’s sixth full-length, 1974’s The New Favourites Of Brinsley Schwarz. Not only is it tighter and catchier than Silver Pistol, it kicks off with a harmony-drenched Lowe classic called “(What’s So Funny ’Bout) Peace, Love, And Understanding.” The song was readily absorbed by one of the group’s ardent followers, Declan MacManus, himself an aspiring pub-rock songwriter in a dead-end band called Flip City. A few years later, reborn as Elvis Costello, he recorded a faithful rendition of the song for the U.S. version of his third album, Armed Forces, which Lowe produced. After Brinsley Schwarz dissolved in 1974, Schwarz and keyboardist Bob Andrews joined forces with Martin Belmont of Ducks Deluxe—a gruff yet infectiously tuneful pub-rock powerhouse—to play with rising singer-songwriter Graham Parker. Dubbed Graham Parker And The Rumour, the pseudo-supergroup released its debut, Howlin’ Wind, in 1976. A rich stew of blues, country, soul, pop, and even reggae, the album sounds uncannily like a mellow precursor to Elvis Costello’s debut, 1977’s My Aim Is True. Parker would soon be lumped into the so-called Angry Young Men cabal with Costello (as well as Joe Jackson, another celebrated songwriter whose early work shows a distinct Parker influence). But in spite of Costello’s pub-rock pedigree, My Aim Is True is its own beast entirely; Howlin’ Wind, while adventurous for a pub-rock record, is still firmly anchored in that scene and sound, even though Parker would quickly drift away from it. As the dusk of pub-rock dovetailed with the dawn of punk around 1976, some bands fell between the cracks of the two scenes. The brightest and best of these crossover groups is Eddie And The Hot Rods. Their ’76 debut, Teenage Depression, whittled pub-rock’s R&B tendencies to a razor’s edge while ditching the singer-songwriter angle altogether. Built around its chugging, pogo-ready title track, it’s a lean slab of electrifying rock ’n’ roll, but The Hot Rods’ sophomore full-length, 1977’s Life On The Line, is even better. Clearly a ploy to outlive pub-rock and punk, the album combines the best elements of each while flirting with anthemic power pop. Life On The Line’s high point, “Do Anything You Wanna Do,” remains one of pub-rock’s greatest singles, even though it bears none of the laidback, bucolic vibe of pioneers like Brinsely Schwarz, Eggs Over Easy, and Chilli Willi And The Red Hot Peppers (some of which, to be honest, sound like dregs of The Grateful Dead). Where not to start: Like his friend and collaborator Elvis Costello, Nick Lowe cut his teeth on pub-rock. And like Costello, Lowe completely outgrew that pigeonhole by the time he started making solo records. Lowe’s first two albums, 1978’s Jesus Of Cool and 1979’s Labour Of Lust, are incredible—so much so that they utterly transcend pub-rock and really can’t be considered examples of the subgenre. Another Lowe associate, Dave Edmunds, became his partner in the mildly successful Rockpile, but Edmunds’ solo albums throughout the ’70s are frustrating: Comprised almost entirely of oldies covers, they offer only tantalizing glimpses of Edmund’s latent greatness, though his best album, 1977’s Get It, sports a whopping five originals. Granted, pub-rock groups typically stocked their live sets with a profusion of ’50s and ’60s covers, but Edmunds had a cleaner, more crystalline sound, even when he was paying tribute to Hank Williams rather than Phil Spector, and his association with pub-rock is more peripheral than representative. Dr. Feelgood has become synonymous with pub-rock. The band became the movement’s most visible and successful act, and its slashing, choppy, pick-less guitarist Wilko Johnson has been cited as an inspiration by everyone from Joe Strummer to Paul Weller, whose first album with The Jam, In The City, bears a strong pub-rock influence. The only problem: Dr. Feelgood’s music is actually pretty damn bad. Bland, brittle, and mechanical, it sounds like blues-rock pumped out by technicians rather than musicians. The energy and chops are evident on hit albums like 1975’s Malpractice and 1977’s Sneakin’ Suspicion, but even the group’s live record, Stupidity—which hit No. 1 on the UK charts in 1976—lacks anything resembling wit, personality, or memorable songs. After a dose of Dr. Feelgood’s tuneless, monochrome R&B, it’s a surprise most listeners didn’t go running for the nearest Yes album. It’s a sad irony that the most prominent pub-rock band is the last one newcomers should check out—not that they really need to bother at all.